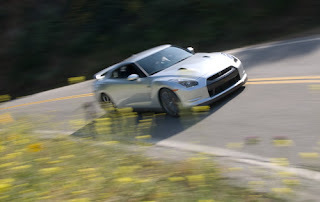 "For a few seconds, you give in to the spectacle of driving a 2009 Nissan GT-R. This car attracts its own entourage and then takes you along for the ride. It's not just the Skyline mystique, either. It's the fact that even in production sheet metal, the R35 GT-R looks like a one-off concept stolen from a Southern California design studio. It has as many hard contours as a Porsche 911 has soft curves. You have the key fob, and still you ogle it." "Our U.S.-spec R35 loses its edge over the JDM GT-R by the quarter-mile mark, though. It runs an 11.7-second quarter-mile at 116.8 mph, while the Japanese car goes through in 11.6 seconds at 120.9 mph. Note that these latest numbers reflect our transition to reporting NHRA-style trap speed, which is the average of a car's speed over the last 66 feet of the quarter-mile." "Even if you look at the U.S.-spec GT-R's instantaneous quarter-mile speed of 117.7 mph, there's no denying it's slower than the JDM GT-R. The reason is, it's making fewer horsepower while running on our inferior 91-octane gasoline. The red GT-R benefited from the 94-to-95-octane fuel that's readily available in Japan."